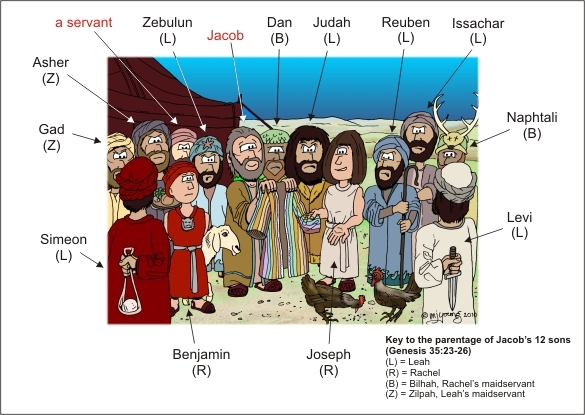 Bible Cartoons: Jacob’s sons - Who’s who? I’ve just completed the scene in Genesis 37, where Jacob gives a coat of many colours to Joseph. Some time ago, whilst I was reading the Old Testament, I decided that it would be a good idea to create a banner for each of the 12 tribes of Israel. I thought it would be easier to identify them in my drawings, if they had some sort of banner or heraldry. The 12 tribes of Israel are direct decedents of the 12 sons of Jacob. For several months I have been drawing the banners, basing my designs in scripture to be found in Genesis 49:1-28, where Jacob blesses his sons. Genesis 49 verse 1 says, ‘Then Jacob called together all his sons and said, “Gather around me, and I will tell you what is going to happen to you in the days to come.’ There follows Jacob’s prophesy about each son, which provided a visual image for my banner design. For example, Reuben (Jacob’s oldest son) is described by Jacob as being ‘as unruly as the waves of the sea’ & so I thought I would create a sea wave pattern & colour scheme, which reflects this prophecy. Having decided on which design element & colour would reflect which son, it was easy, when it came to drawing this particular cartoon (Jacob giving the coat to Joseph) to simply colour each son’s clothing according to the colour scheme I had previously worked out. Below is a copy of the cartoon I have just finished, with details of who’s who. The sons of Leah I have grouped together & given them the same skin & hair colour. The sons of Rachel, the sons of Bilhah & the sons of Zilpah are similarly grouped together by skin & hair colour.